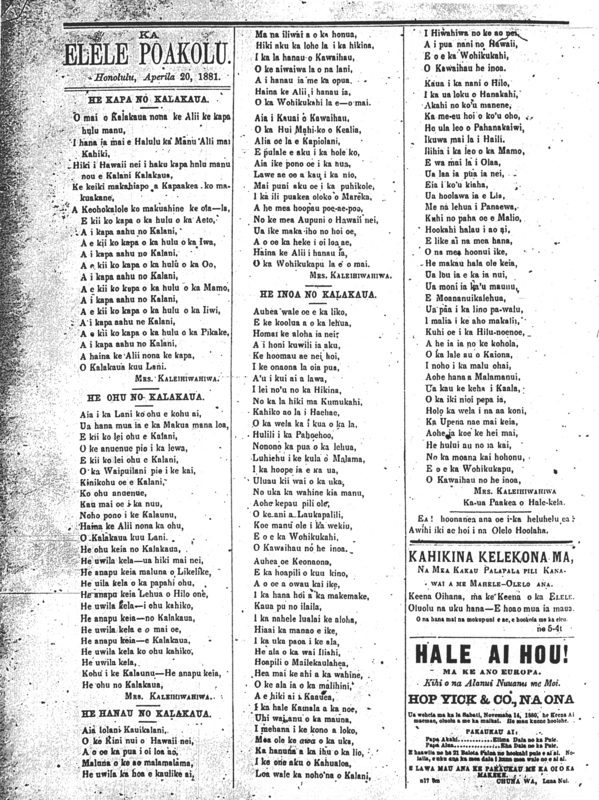 Set of mele composed in honor of King Kalakaua, 1881. O ka Wohikukahi la e—o mai. O ka Wohikukapu la e o mai. O Kawaihau no he inoa. Loa wale ka noho’na o Kalani. Ka Elele Poakolu, Buke II, Helu 7, Aoao 2. Aperila 20, 1881. 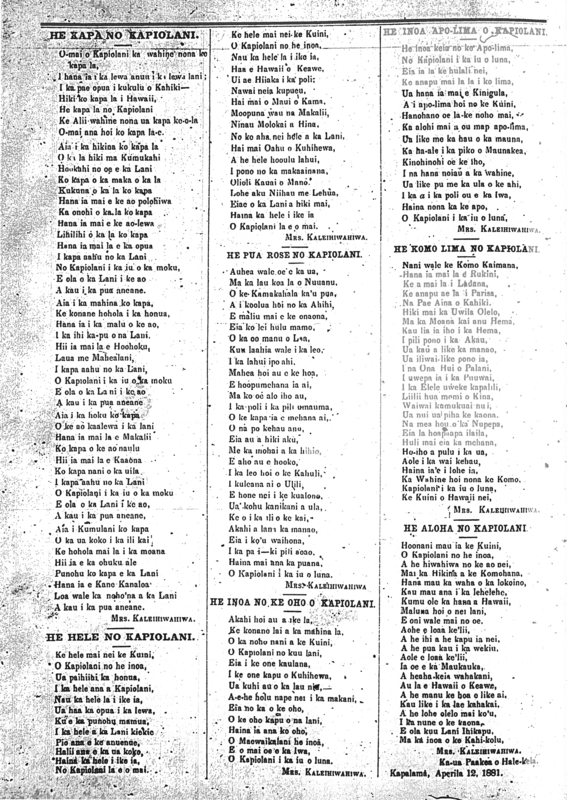 Does anyone recognize the name Maewaikalani (from the mele in the last post, “He Inoa no ke Oho o Kapiolani” by Mrs. Kaleihiwahiwa) as a known name for Kapiolani? Speaking of Queen Kapiolani, here is a set of sweet mele composed in her honor! 1881. O-mai ana hoi ko kapa la-e.
A kau i ka pua aneane. No Kapiolani la e o mai. O Kapiolani la e o mai. HE PUA ROSE NO KAPIOLANI. O Kapiolani i ka iu o luna. HE INOA NO KE OHO O KAPIOLANI. HE INOA APO-LIMA O KAPIOLANI. HE KOMO LIMA NO KAPIOLANI. Na Pae Aina o Kahiki. Ke Kuini o Hawaii nei. Ma ka inoa o ke Kahi-kolu. [This newspaper, Ka Elele Poakolu, is yet another one not available online even if it is microfilmed. I am not sure how ulukau.org missed digitizing this when they were under agreement many years ago to put up all of the available newspapers online… To view the pages, you have to find your way down to one of the institutions which have Hawaiian-Language Newspaper microfilms. Ka Elele Poakolu, Buke II, helu 6, Aoao 6. Aperila 13, 1881.